Missing presumed dead, 8th October 1916, age 24. Charles was born in Leicester, England on 28th May 1892 and the son of Charles Masters Duplock and Eliza Jane (Cave). Charles Sr and Eliza married in Wellingborough, Northants in 1889 and in the 1901 census were living in Wycliffe, Leicester with another son named Marten Cave who was born in 1890. They were to have no more children. Sometime after the 1901 census the family moved to North Wales (probably Prestatyn). Charles Masters died in St Asaph in 1910 aged 48 and the 1911 census found his wife, 53 year old Eliza Jane, living at “Prospect,” Ffordd Las, Prestatyn with a visitor named Mary Duplock aged 42. The website “UK Outward Passenger Lists 1890 – 1960 has an entry for Charles. C.L. Duplock, age 20, a labourer, left Liverpool on February 21st 1913 on the Empress of Ireland. The destination was St John, Newfoundland, Canada. The shipping line was the Canadian Pacific Railway, and the ship’s Master was I.V. Forster. 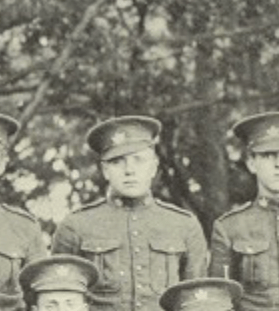 Charles’ military records are available on the Government of Canada Library and Archives Site in the First World War section. He was attested at Hamilton on July 27th, 1915, for the 76th Overseas Expeditionary Force, for the duration of the war. His date of birth was May 28th 1892 at Leicester, and his mother, Mrs E J Duplock, of “Prospect”, Prestatyn, was his next of kin. His trade was an electrician, and he was not married. His description on enlistment was that he was age 23years and 2months. His height was 5’6”, his girth was 35 “with a 3” expansion He had a fair complexion, with fair hair and blue eyes. His religion was Church of England, and he was passed as fit for service overseas. Charles’ Casualty form states that he embarked at Halifax on April 23rd 1916 on the troopship Empress of Britain, and disembarked at Liverpool on May 5th. He was at the Canadian Base Depot on June 29th, and on July 7th, left there for his unit. On July 16th he joined his unit, and the next entry is that he was declared missing on October 15th, in the field. We are sorry to hear that the son of Mrs Duplock, Prospect, has been missing since October 8th. On June 23rd 1917, the records show that Charles could be presumed dead for official purposes. A copy of his will, written on July 10th 1916, was extracted from his paybook and forwarded to his mother. In it, he left “the whole of my property and effects”, to her. A separation allowance was awarded to Mrs Duplock, and it was noted that Charles was not the sole support of his widowed mother; she had another son who was a 2nd Lt. in the Bedford Regiment, Colchester (This was Marten Cave Duplock, who was later killed in action in April 1918.) The Prestatyn Weekly April 20th 1918, after reporting Marten’s death, reports that Mrs Duplock’s youngest son has been missing since October 1916. However, payments to Mrs Duplock in respect of Charles were commenced on December 1st 1916, and she was “paid in full”, an amount of £20, on December 31st. The records show that Charles’ scroll and memorial plaque were sent to Mrs Duplock, who had now moved to Rose Hill, Queen’s Park, Colwyn Bay. Mrs Eliza Jane Duplock, who had lost both her sons in the War, died in Liverpool in 1933. Image of Charles taken from Canadian Virtual War Memorial.